:Evan Howard, a noted authority on Christian spirituality, provides a holistic, accessible, and informed introduction to Christian spiritual formation written from a broadly evangelical perspective. Howard joins Scripture with themes of community, spirit, formation, and mission in a single integrative guide. The book includes helpful features such as figures, charts, chapter overviews, and formation-focused questions. Its evangelical-ecumenical and global perspectives will appeal to a wide audience. Resources for professors and students are available through Baker Academic's Textbook eSources. 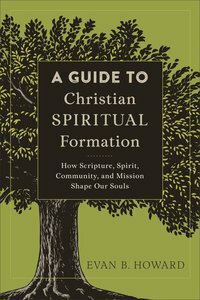 About "A Guide to Christian Spiritual Formation: How Scripture, Spirit, Community, and Mission Shape Our Souls"
Evan B. Howard (PhD, Graduate Theological Union) founded and directs the Spirituality Shoppe, an evangelical centre for the study of Christian spirituality. In addition, he is a lecturer in philosophy and religion at Mesa State College in Grand Junction, Colorado, as well as the author of Affirming the Touch of God: A Psychological and Philosophical Exploration of Christian Discernment, The Brazos Introduction to Christian Spirituality, and Praying the Scriptures: A Field Guide for Your Spiritual Journey.